You gain 5,500 points [?] Loyalty program points By purchasing products included in the loyalty program, you gain points, which then can be exchanged to other products available in the store or for a permanent discount. Only available to registered customers. Let's be honest, the original Dell Streak had a bit of an identity crisis. The 5-inch device wasn't sure if it belonged in the tablet or smartphone world, and ultimately it was targeted at a pretty niche user. But its larger brother, the Streak 7, is more self-aware. It's a honest-to-goodness tablet meant for doing all those tablet-y things -- surfing the web, reading e-books, watching video and more. Sure, the Streak 7 may just look like an enlarged version of the 5-inch version, but they differ in more than just screen size: the 7 packs a powerful 1GHz dual-core Tegra T20 processor, 1.3 megapixel front facing camera, 5 megapixel lens on the rear, T-Mobile "4G" HSPA+ connectivity, and 16GB of internal memory. 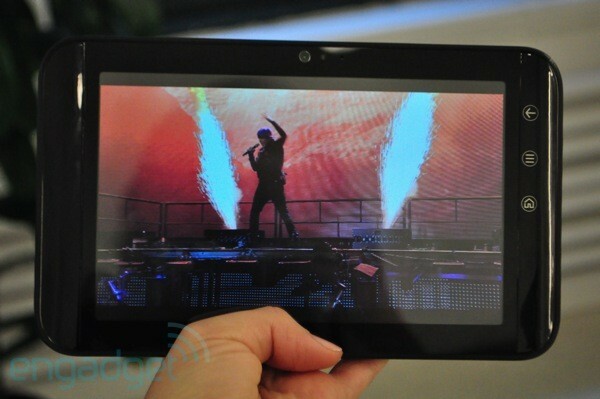 The tablet runs Android 2.2 with Dell's Stage UI for now, but Dell promises an upgrade to Honeycombonce it's ready. It sounds like one of the more well-rounded 7-inch tablets on the market right now and at just $200 on contract at T-Mobile (it's $450 without), it's actually quite well priced. However, there are quite a few things that are going to keep 7-inch tablet seekers from forking over the cash. What are those? We'll tell all in our full review -- read on for more! No matter how you slice it, the Streak 7 looks like a giant Streak (the 5-inch version, that is), and that's not necessarily a bad thing considering we've always had a thing for those tapered sides and its fairly rigid, plastic build. Dell's obviously trying to maintain a similar design across all the Streak family members, although it's also brought in some cues from the Venueand Venue Pro relatives -- the rear cover has the same textured diamond pattern as the smartphones. We like how it feels in the hand, but unlike the original Streak, the back doesn't house a removable battery. That actually turns out to be an incredible bummer given what you're about to find out about the battery life farther down in this review. While many slate makers are moving towards the 10-inch form factor, we're still appreciative of the portability of the 7-inch variety. (Yes, so much so that some of us are even dying for a 7-inch iPad.) Like the Galaxy Tab or Archos 7, the Streak 7 lends itself much better to one-handed use than the iPad or any of the other 10-inch tablets we've tested. We loved being able to comfortably hold the 0.48-inch Streak up when reading a book in bed or wrapping both our hands around the 0.9-pound tablet and being able to use our thumbs to type. 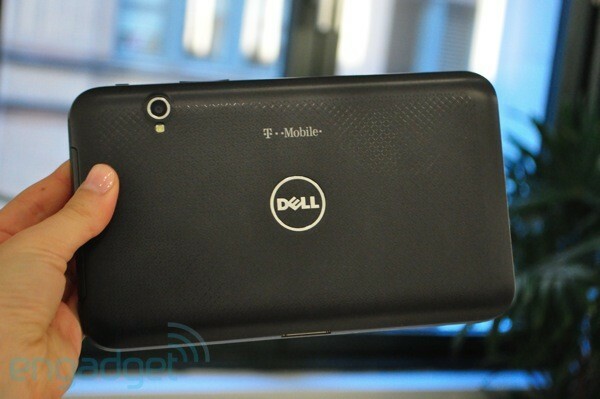 Apart from the three capacitive buttons (back, menu, and home), mic, and camera on the front of the tablet, Dell's kept the design very clean. A plastic latch on the right edge, which can be hard to open if you don't have long nails, hides the SD and SIM card slots. The top of the device has a power button and volume rocker, and the left edge a 3.5mm headphone jack. Disappointingly, there's no HDMI output on the device itself; Dell will offer a separate dock that will attach to the PDMI port on the bottom of the device. A quick word on the PDMI port -- it is the same as the one on the original Streak, and because there's no other USB port on the tablet, you've got to have the cord handy to either charge it or connect it to computer to sideload files. Also, our review unit hasn't been charging via USB -- you have to plug it into the wall via its AC adapter. Yeah, it's pretty annoying. 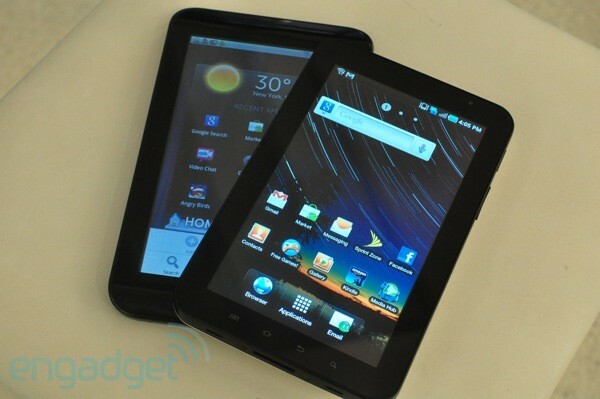 When powered off, the Streak 7 looks like it has virtually the same display as the Galaxy Tab. Both have highly glossy, 7-inch Gorilla Glass screens that feel incredibly smooth to the touch. However, that all changes when you turn them on. In comparison to the Galaxy's 1024 x 600 resolution display, the Streak's 800 x 480 panel just looks cheap, and the experience is definitely felt when browsing, reading, looking at photos, or watching a high-definition clip. In a side-by-side comparison of the same photo, the Streak 7 just looked low-rate in comparison to the Tab's crisp rendering. Yep, it's pretty much a Pixel Density Enthusiast's nightmare. Even more noticeable is how much brighter the Galaxy Tab's display is. Hands down, Samsung went with a better quality panel than Dell, and it really makes a huge difference considering, you know, the entire tablet experience is centered around the screen. That quality also translates to mediocre viewing angles -- when held horizontally at about 45 degrees, colors start to fade to black. Vertical viewing is better, although in comparison to the Galaxy Tab's screen, which can be seen at virtually every angle, it's yet again just second rate. Beyond all the actual viewing quality issues, the capacitive screen is extremely responsive, and it, along with the Tegra 2 processor, keeps it responding to our taps and flicks quickly. The accelerometer was equally as snappy, though we wish there was a quicker way to disable it than having to go through the display settings menu. While most tablets announced at this year's CES wait on Google's release of Android 3.0 Honeycomb, which has been designed for tablets, Dell's gone ahead and released the Streak 7 with Android 2.2. We're well aware that there are no Honeycomb tablets shipping yet, but there's something about the Streak that just feels rushed to market, and that experience is even more pronounced when you realize Dell didn't do anything on top of the OS to make it more tablet friendly. The software experience is the exact same as that on the original Dell's Streak and Venue -- it consists of the Stage UI, which includes Dell's own full-screen widgets and launcher. The widgets are actually useful -- the Home pulls in the local weather and recently used apps, Social your Twitter or Facebook feed, Web a search bar and thumbnails of your bookmarks, and Gallery locally stored pictures. The good news here is that if they aren't your thing, you can easily delete them and customize the panes with regular Android widgets and apps. 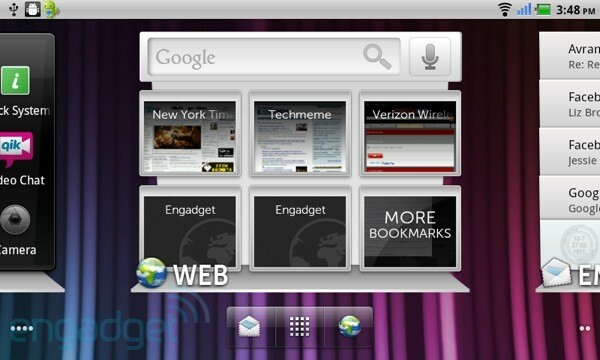 The launcher at the bottom provides easy access to the browser, app tray, and mail app. We've been trying to figure out how you can customize the launcher, but we haven't come up with a solution yet. On the topic of that mail app, it nor any of the other native apps, like the calendar or messaging, have been revamped to take advantage of the extra screen real estate. Unlike Samsung, Dell's done no retooling here to take advantage of the larger screen, though considering the resolution is the same as the Streak, it may have just figured it didn't really need to. If we had to sum up the software package, we'd say that you're really just dealing with an oversized smartphone experience here, and while a few months ago that may have been enough for Android tablet seekers, that's about to change as soon as Google releases Honeycomb in the coming days or weeks. Dell preloads the Steak with quite a few applications. Ours came with BrainPOP (a educational game for kids), Zinio (a magazine app), Kindle, Let's Golf, Blockbuster and Slacker Radio. T-Mobile also throws on its T-Mobile TV and Qik Video Chat apps. It also comes with Swype, though the size of the device lends itself quite nicely to regular thumb typing. Speaking of that Qik Video Chat app, we were able to successfully chat with a former colleague using the 1.3-megapixel front facing camera. The app itself doesn't provide the best quality video -- it was better on WiFi than 4G, but it's still not desktop grade video calling. That said, when we took some stills with the front lens, we found the quality to be decent -- unfortunately, it picked up the bags under our eyes and our messy hair. Obviously, in comparison, the 5-megapixel cam on the rear took much crisper shots, although they seemed a bit washed out. We still have to admit taking a picture with a 7-inch viewfinder is nothing but awkward. Still, the auto focus was quick and the flash came in handy when we went to take shots in a dark taxi cab. 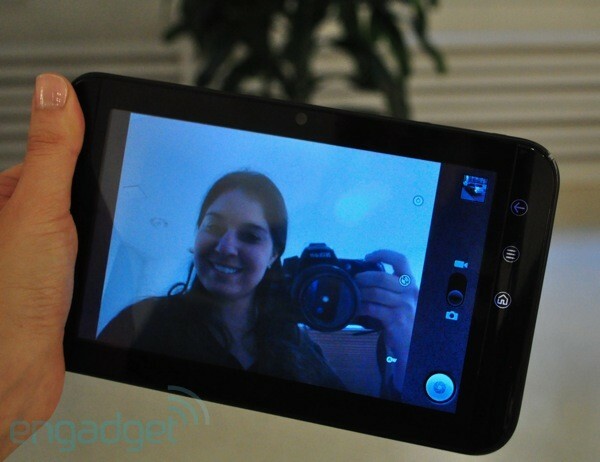 There's no continuous or panorama shooting mode like the Galaxy Tab, but the Streak 7 can record 720p video. Motion capture was quite smooth, though the footage was fairly grainy and oversaturated. 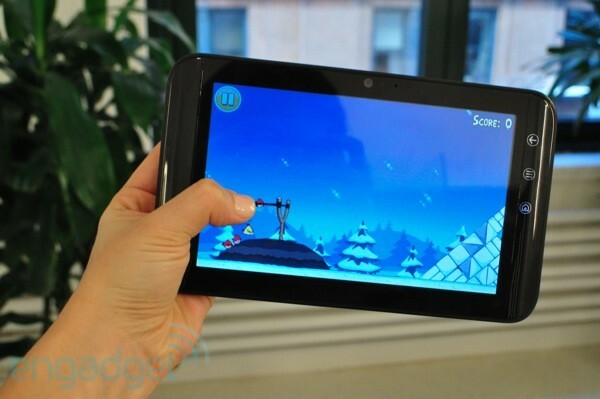 The Streak 7 is the first tablet we've tested with NVIDIA's 1GHz dual-core Tegra 2 T20 processor. Oddly, the device indicates that the processor is downclocked to about 800MHz, and Dell tells us that it downclocks to conserve power. Either way, the performance was extremely snappy. In most instances, we found it to be more responsive than the Galaxy Tab -- there was no lag opening applications, scrolling down webpages, or flicking through Dell's Stage widgets. Similarly, games like Asphalt 5 and Angry Birds were very fluid. 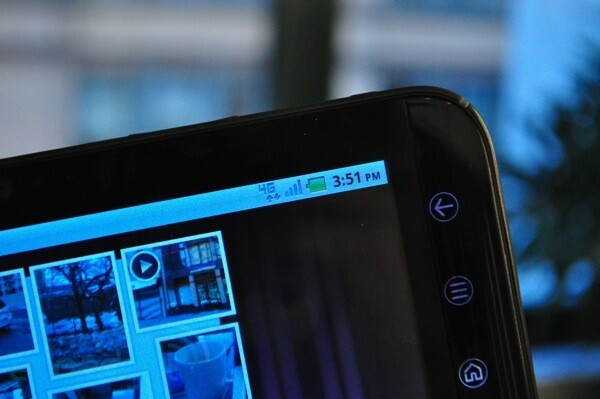 Beyond promising fast performance, Tegra 2 promises full HD playback, and the Streak 7 certainly confirms that. A 1080p clip of Justin Bieber's Never Say Never played with no stuttering or lag, however, that's obviously pretty pointless considering the lower screen resolution. That aforementioned dock with HDMI-out will be the solution for those looking to take advantage of that HD video. Streaming 720p video on YouTube also worked quite well and general Flash performance was pretty decent -- we were able to get some of the New York Times' Flash videos playing within a few seconds of loading the site. The Streak 7 notched an average of 35 MFLOPS in Linpack -- that's considerably better than the Galaxy Tab's 14 MFLOPS. Sadly, that good performance news turns quite sour when it comes to battery life. There's no way to beat around the bush on this one: the Streak 7's battery life seriously disappoints. In our past few days of usage, the most we've been able to squeeze out of it was about six hours of juice. We powered on the device at 6 pm on Friday evening and after about five hours of intermittent usage on T-Mobile's 4G network -- checking Twitter, e-mails, looking up a few addresses on Google Maps, and surfing the web -- the tablet was totally dead. With just WiFi on, we got closer to six hours of sporadic use. Similarly, on our battery rundown test, which loops the same standard definition video with brightness set at 65 percent and WiFi on, the 2780mAh battery only lasted three hours and 26 minutes. That's halfas long as the Galaxy Tab, and while that's to be expected since the Tab has a larger 4000mAh cell, it really is pretty inexcusable for a highly mobile device like this. Sure, keeping T-Mobile's HSPA+ or "4G" network enabled (or any wireless network for that matter) eats at the battery life, but it also provides some seriously fast browsing speeds. Out and about in NYC, we saw an average of 2975kbps (2.98 Mbps) on the downlink and 1516kps (1.52 Mbps) on the uplink. If those numbers aren't your thing, we can tell you that it just felt faster than our Sprint 3G Galaxy Tab at opening this very site and streaming YouTube videos. As we said earlier, there was still quite a bit of lag when we went to make a Qik call over the 4G network, but it was at least tolerable -- calling on Sprint's 3G network is really a waste of time. We were able to launch the tethering and WiFi sharing mode and take advantage of the speeds on our laptop, and T-Mobile generously includes that feature in both its prepaid and postpaid plans. T-Mobile offers its usual webConnect broadband plans for the Streak 7: 5GB a month for $50 for new customers and $40 for existing T-Mobile customers. There's also a 200MB plan for $30 a month. There are also prepaid plans which include $10 a week for 100MB, $30 a month for 300MB, and $50 a month for 1GB. As you may have guessed, you can't make phone calls over T-Mobile network with the Streak 7, but you can send text messages. Ironically, despite the Dell Streak 7's improved specs, it finds itself in no better place than the original Streak: it runs the same software, and while it has a larger screen, the resolution doesn't make it anymore useful. And hey, it can't even make phone calls! Yes, sadly, at the close of yet another Dell tablet review, we're left wishing the company put a little more love into what could have been a pretty great product. We're actually not even sure why the guys in Austin decided to bring the Streak 7 to market in its current form. There's no doubt that at $199.99 on contract / $450 off contract the tablet is one of the more decently priced Android slates out there, and its HSPA+ speeds make it incredibly fast, but when you combine its low-resolution screen, poor battery life, and soon-to-be outdated OS, we simply can't recommend it, even if it doesn't break the bank. For those, that need to have a 7-inch Android tablet right now, we'd suggest the $500 Galaxy Tab -- the screen is noticeably better and it lasts twice as long on a charge. (Keep in mind, we're not positive that the Tab will be upgradable to Honeycomb, so you're taking a risk there). There's also the $250 Nook Color, which is really aimed at reading and light browsing, but can be rooted every which way if that's your thing. However, with the Motorola Xoom, LG G-Slate, Toshiba Tablet, and a handful of other slates on the horizon, what we'd really recommend, is hanging tight and waiting for the Honeycomb tablet era to begin.